Wick, July 2nd2018 – Class-leading offshore energy support vessel (OESV) operator, Seacat Services, has secured a further charter agreement at Beatrice Offshore Wind Farm (Beatrice). This latest 2-year contract will see Seacat Mischief and her sister vessel, Seacat Magic, provide logistical support to manufacturer and service provider Siemens Gamesa Renewable Energy (Siemens Gamesa) throughout the operations and maintenance (O&M) phases. The pair of 23-metre jet propulsion catamarans will be based out of Wick Harbour in Scotland, with Seacat Mischief arriving on site in mid-August, and Seacat Magic in April 2019. 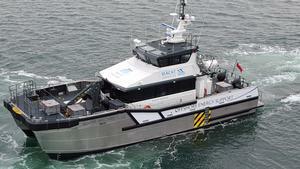 They will become the third and fourth Seacat Services vessels to work at Beatrice, joining Seacat Resolute, which has just commenced a separate 9-month construction charter for Siemens Gamesa, and Seacat Intrepid, which remains on charter for project developer Beatrice Offshore Wind Limited (BOWL).